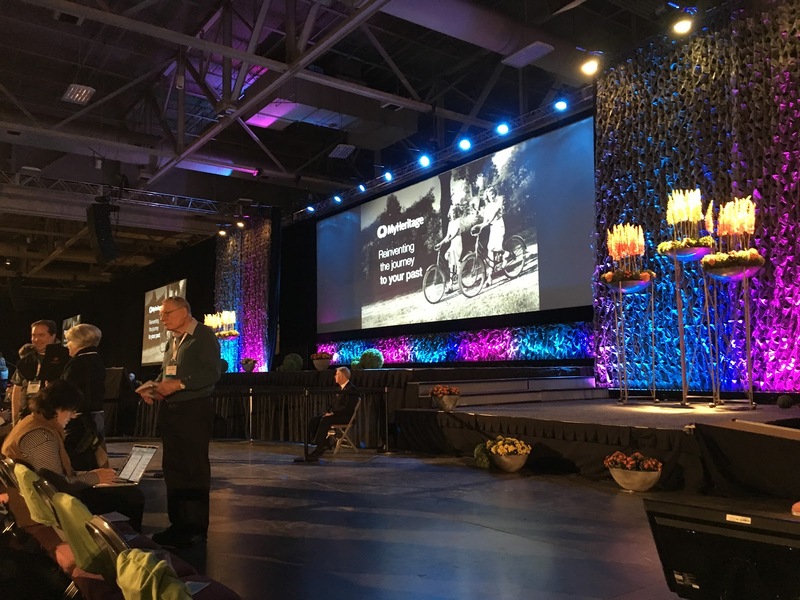 For me, this year's RootsTech was about family stories, interviews and friends. This being my first time to RootsTech, I was pleasantly surprised how much I thoroughly enjoyed the event. 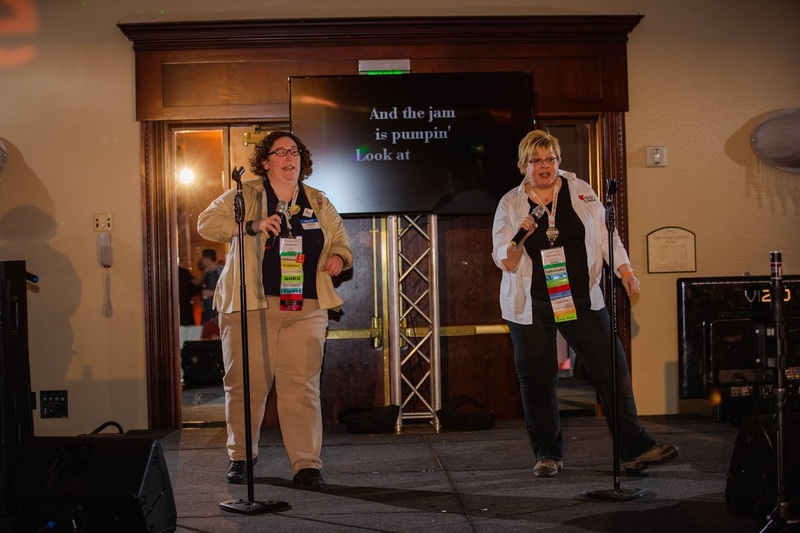 From meeting longtime Facebook friends in real life, reconnecting with acquaintances and friends, to meeting new cousins, and colleagues, RootsTech delivered this plus more. I had the opportunity of meeting a big group of Commonwealth genealogists who gathered for dinner the night before RootsTech. Jill Ball of GeniAus made all the arrangements. We had genealogists from England, Canada, Australia and New Zealand gather for an opportunity to meet, drink and be merry! The opening session of RootsTech was headed by Steve Rockwood, CEO of FamilySearch. He called family historians the "heart specialists" of their family's stories. What a great perspective. This year's RootsTech theme was all about telling, sharing, and preserving your family stories for years to come. Paula William Madison, RootsTech Opening Session, 2016. What a story Paula Williams Madison had to share with us about her mother, grandfather and their Chinese family. Paula shared a little bit about the heart-breaking, incredible journey of discovering and meeting her grandfather's family. I'm looking forward to reading the whole story in her book Finding Samuel Lowe. Team CanGen at the Salt Palace, Salt Lake City, 2016. With my colleagues, Mike Quackenbush and Christine Woodcock, we quickly became known as Team CanGen. We three are the organizers and creators of The Great Canadian Genealogy Summit. Team CanGen had the privilege of interviewing Find My Past Executive Vice President of Operations, Ben Bennet, and Chief Marketing Officer, Gail Rivett. They shared a little bit of what is coming to Find My Past with Canadian records. Check out our interview. What happens when you get a bunch of genea-friends together in the RootsTech Media Hub? Lots of laughter! Christine and I were interviewed by Shannon Combs Bennett and Jennifer Alford of The In-Depth Genealogist. Both Christine and I write columns for IDG's same titled digital monthly magazine. We had the opportunity to share with Jen, Shannon and their readers what the upcoming The Great Canadian Genealogy Summit is all about in our interview. There were 'after parties' to attend. MyHeritage put on a spectacular after party with food, games and karaoke. Apparently, what happens at the MyHeritage RootsTech after party doesn't stay there. Lots of photos and videos were shared on Facebook and Twitter. 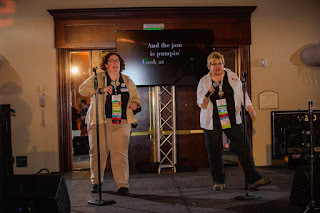 Jen Alford and Kathryn Lake Hogan singing "Pump Up the Jam" at the MyHeritage after party, 2016. Christine, Mike and I were especially excited to be invited to Dear Myrtle's RootsTech after party. Myrt is such a lovely hostess. 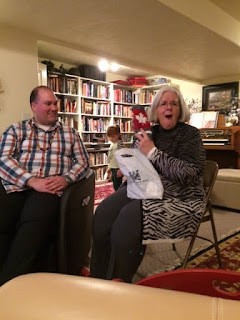 We surprised her with a special Canadian gift - mittens from the Hudson's Bay Company. Dear Myrtle likes her Canadian mittens from Team CanGen, 2016. Photo by Christine Woodcock. I'll be posting some more highlights from RootsTech this week. It was such fun and I hope to attend again in 2017.